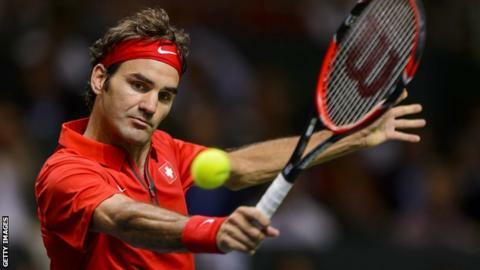 Roger Federer and Stan Wawrinka both recorded straight-sets victories to give Switzerland a 2-0 lead over Italy in the Davis Cup semi-final in Geneva. Federer beat Simone Bolelli 7-6 (7-5) 6-4 6-4 while Wawrinka defeated Italy number one Fabio Fognini 6-2 6-3 6-2. Richard Gasquet and Jo-Wilfried Tsonga also won their semi-final singles to give France a 2-0 lead over defending champions Czech Republic. Gasquet beat Tomas Berdych while Tsonga defeated Lukas Rosol in Paris. Playing indoors, world number three Federer and Australian Open champion Wawrinka can clinch a 3-0 series victory in Saturday's doubles, which would send Switzerland into their first Davis Cup final in 22 years. Italy defeated Great Britain in April's quarter-final in Naples. "It was quite frustrating at times," said Federer. "But I am happy overall, it was important to get that point." At the French Open venue Roland Garros, it took Gasquet two hours and eight minutes to beat Berdych 6-3 6-2 6-3 in the first semi-final singles match on Friday. Tsonga then despatched Rosol 6-2 6-2 6-3 in just over one hour and a half to put France one win away from a place in the final.